Okay, I admit it... 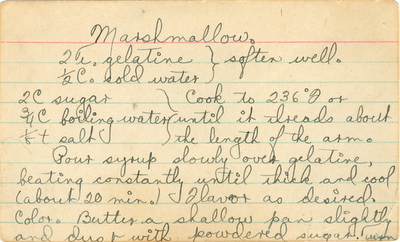 I'm not brave enough to try the vintage recipe for homemade marshmallow that I found in my Grammy's recipe box. There. I said it. Not to make excuses, but I have visions of me in the kitchen creating more heat than is sane and ending up with a mess akin to the attack of the StayPuft Marshmallow Man on New York City. One blog I enjoy reading is by Emily at Sugar Plum. 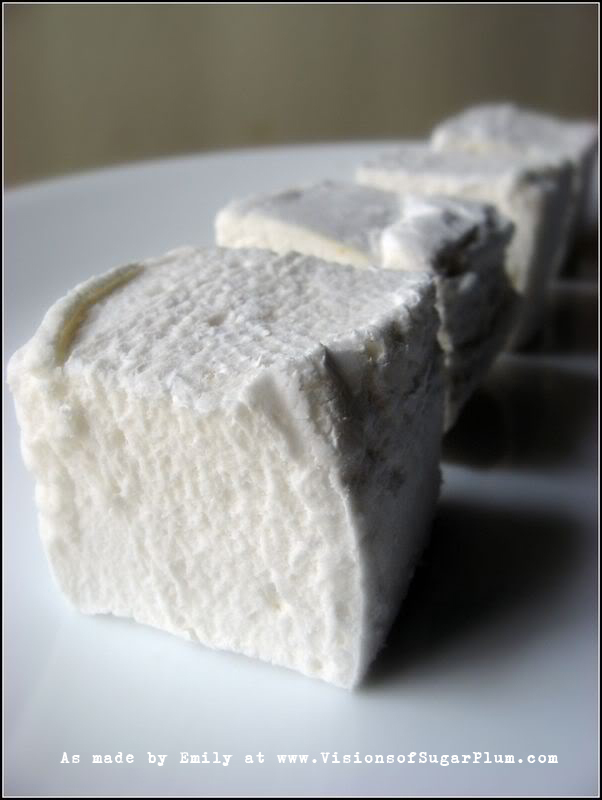 One evening she mentioned on Twitter that she was considering making some homemade marshmallows. I asked her later if she had and admitted my lack of bravery in trying Grammy's recipe. This was her reply, "I didn't try :( I decided it was too much work--might try in a few minutes. Need to find a recipe. Wish I had Grammy's recipe." Well... Emily asked and she received! 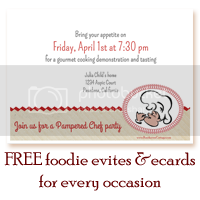 Take a look at a digital scan of the recipe below. It was written in fountain pen by my Grammy sometime between 1910 and 1930-ish (I've also typed it out below). The way I can date this recipe is that some of the other recipes my Grammy's box are actually dated with Esther's name in the top right corner. 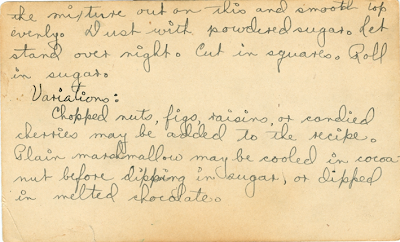 This undated recipe looks like those dated ones so that's how I can zero in on a date. This would have been an early version of her handwriting. Pour syrup slowly over gelatine, beating constantly until thick and cool (about 20 min.). Flavor as desired. Color. Butter a shallow pan slightly and dust with powdered sugar. Turn the mixture out on this and smooth top evenly. Dust with powdered sugar. Let stand overnight. Cut in squares. Roll in sugar. Chopped nuts, figs, raisins, or candied cherries may be added to the recipe. 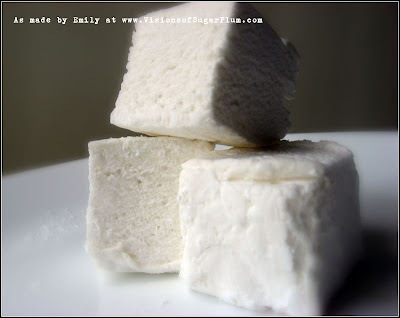 Plain marshmallow may be cooled in cocoa-nut before dipping in sugar, or dipped in melted chocolate. Emily took on the daunting challenge and succeeded! The photo above is hers (she's an amazing food photographer). I'm so impressed. And I'm still too chicken to do it myself. The only person I ever heard of making their own marshmallows was Martha Stewart. I admit, they do look better than the store bought. I love that you're photographing your grandma's recipe cards. I have my mom's handwritten recipes. She passed away in 2004.